That’s right, the Indians are the only team in the division with at least a .500 record. Actually, on Friday night the entire division was under .500. The Royals had beaten Cleveland that night, leaving them at 18-19 at the top of what has become a poor, beaten-down, pathetic division. More than likely the Indians and probably even the Twins will finish with a winning record when it is all said and done, but right now this is an ugly picture. When the Royals have played very uninspired baseball to this point and they are only sitting 7.5 games out of the lead, that is not a good sign. That season ended with the Rangers leading while being ten games below .500. Then the strike happened and baseball didn’t come back until the next season. But it does make you wonder about when it will happen and how soon the pundits will flip out. I can already picture the “talking heads” discussing how such a weak team will grace postseason play and “tarnish” the good name of baseball. Earlier this week Matt Harvey was dealt to the Cincinnati Reds for catcher Devin Mesoraco, ending his time in New York. While many will question his arm and whether he will even return to his former self, to me the bigger question is whether or not his ego and pride will allow him to be successful again. Don’t get me wrong, he pitched very well on Friday: 4 innings, 1 hit, 0 runs, 0 walks and 2 strike outs against the Dodgers, all of which spells a great debut in Cincy. But at the end of the day his performance wasn’t the lone issue clouding him. No, his issues are paramount and solving these problems need to be his choice, not forced onto him. In my opinion, the Mets had the right idea; send him down to the minors and break his entire game down to rebuild it. But Harvey’s pride and stubbornness got in the way. Maybe getting out of ‘The Big Apple’ will help, but I tend to think we will see him struggle again, soon. Matt Harvey loves being ‘Matt Harvey, the dominant stud pitcher’ or ‘Matt Harvey, busy man on the town’ more than he loves being just a guy who gets to play baseball for a living. Until he recognizes himself as the biggest problem, there just won’t be a happy ending for the man formerly known as ‘The Dark Knight’. About a week ago MLB.com scribe and (in my opinion) one of the best baseball writers of this era Joe Posnanski posed an interesting question about Nick Markakis: can he realistically reach 3,000 hits? Before you start laughing and thinking that is impossible you might want to go look at his career numbers…now pick up your jaw. Markakis currently sits at 2,105 hits here in his age 34 season. In other words, he only needs 895 hits to reach one of the biggest milestones for a hitter in baseball lore. Outside of players not yet eligible for induction into the baseball Hall of Fame, only two players who have reached 3,000 hits haven’t been inducted into the hallowed halls: Pete Rose and Rafael Palmeiro. Rose is not in because of his lifetime ban and Palmeiro is not because of a positive steroid test. That number–3,000–has always meant an automatic place in Cooperstown and speaks of a player’s longevity and consistency. Markakis checks off both of those marks. But I’m pretty sure you don’t view him as being an all-time great or even a perennial All-Star. On of his list of achievements is a two-time Gold Glover winner and…leading the American League in WAR in 2008. That is it. But what has helped Markakis get to this point is a lack of injuries and a regular spot in the lineup. Markakis has only had one season under 145 games played in a season (2012) and his lowest hit total in a season (outside of 2012) is 143 in his rookie year. If things keep moving at his current pace, he could hold on for another six seasons or so and reach 3,000 around his age 40 season. If that happens, do we then consider him a Hall of Famer? I tend to believe we have to, even if he was never talked about as being one of the top ten players in the game. More than anything, I want this to happen just to hear the discussions about his candidacy. There will be those that will look at 3,000 hits as proof he belongs. Others will argue he was never a “Great” player. Either way, I hope he gets close and I am now rooting for Markakis to reach this milestone. Look, I absolutely loved this for about a million reasons. One, it is always great to see a player return to his former stomping ground and be appreciated for all he did. Two, he was a vital part of that franchise’s return to prominence and was the biggest piece of the puzzle when it came to how that team was built. But it was also great because I have been a fan of Cutch for years. Go ahead and search his name on this blog; you are bound to find me speak nothing but glowing praise his way. McCutchen, much like Bonds before him, was an all-around player who helped push the Pirates farther because of his greatness. He’s not quite the player he used to be at this point of his career, but at one time he was easily one of the top five players in the game. I’ve also kind of felt like the Pirates are the National League’s version of the Royals. Both teams were once a regular participant in the playoffs, only to fall on hard times for a couple of decades and then return to glory. I obviously loved the Royals climb back to the postseason and appreciated Pittsburgh’s return as well. So I am glad Cutch got the standing ovation and I’m glad to see him still loved. He is truly a great player and a great human who deserves all the cheers he gets and more. While I wasn’t nor ever will be a big Hosmer fan, I’m glad to see him contributing in San Diego. Plays like this are why the Padres acquired him and hopefully that doesn’t go unnoticed. When baseball reached the All-Star break, the American League MVP race felt like a two-man battle. Jose Altuve of Houston was once again a top contender while the Yankees Aaron Judge was making baseball writers and analysts go ga-ga as he invoked memories of Ruth and Mantle. The normal leader in MVP conversations, Mike Trout, was sitting on the sideline, finishing up a rehab assignment and hoping to get back on the field after missing close to 40 games. While Trout was the front-runner before his injury, there appeared to be no way he could catch Altuve and Judge in any of the statistics that mattered. But then Trout came back, picking up where he left off, and something happened…Trout slowly climbed up the fWAR leaderboard. Day by day, game by game, Mike Trout was catching up to the two leaders. Just like last year, what appeared to be a two-man race turned into a three-man battle to the end. While it would appear Trout missing those 40 games would deter his case, it’s actually enhancing the argument that he is the 2017 American League MVP. Let’s start with the WAR argument, which I referenced above. As of this writing, Altuve sits atop the American League leaderboard, with 6.5 fWAR. Trout follows with 6.2 and Judge sits in third place with 5.7. Just as an aside, this is just speaking for the hitters in the league; Chris Sale leads everyone with 7.5 WAR and Corey Kluber is at 6.0. Both Sale and Kluber can be calculated into your MVP discussion (and trust me, Sale is in that convo), but at least for me, I don’t value pitchers in MVP talk UNLESS they have been so dominant and crucial to their team’s success (and since I know it will be asked, the next closest Red Sox to Sale’s WAR number is Mookie Betts at 3.8). So Altuve and Trout are 1-2 in hitter’s WAR, but that gap was much larger at the All-Star break. At the break, Aaron Judge led the AL with 5.4 fWAR, followed by Altuve at 4.1 and Trout was down in 6th place with 3.4 fWAR. So in this second half of the season, Altuve has accumulated 2.4 WAR, Judge 0.3 and Trout 2.8. Now, the gap between Altuve and Trout wasn’t that big at the break, but Judge’s lead above both was quite a bit more. So while Trout’s push in this second half has been impressive, Altuve’s has been equally impressive in that short amount of time. What has been the most important aspect of this gain is not just how Trout has shortened the gap between the two candidates; the most impressive part of this whole debate is that WAR is a stat that accumulates over time, so the more you play the higher your number should go. Obviously not every player sees that (Alcides Escobar has played every game this year for Kansas City and his fWAR sits at a sickly -0.3 right now) but if you are an elite player, your Wins Above Replacement will rise the more you play. The fact that Trout has almost reached Altuve in over 150 less plate appearances, says a lot about how good Trout’s season has been. So how is Trout doing with some of the other statistics? Obviously Trout can’t win it on WAR alone, and luckily the numbers prove he won’t. Trout leads the league in weighted Runs Created Plus, weighted On Base Average, On Base Percentage, Slugging Percentage, walk percentage, Win Probability Added, Walk to Strikeout ratio, On-Base Plus Slugging, 2nd in Isolated Power, and 10th in stolen bases. The most impressive out of all these numbers to me is Trout’s Win Probability Added number. Trout is at 5.74; the next closest batter is Nelson Cruz at 3.67. I mentioned earlier how WAR is a stat that accumulates and so does WPA. For Trout to have an over two point lead in a stat that adds up over time is amazing. No other player in the American League has had a larger effect on his teams outcome than Trout AND IT ISN’T EVEN CLOSE! When I think of the term ‘Most Valuable Player’, I think of someone who is so valuable that you can’t even imagine what that team would look like without that player on the field. Trout missed 40 games (40 games!!) and has had a larger effect on his team than any other player in all of baseball. If that doesn’t speak of value, I can’t imagine what else does. Now, there is one slight issue, which is that Trout is not quite a qualified batter, as he is sitting at 325 at bats for the season and 412 plate appearances. Trout would need to reach 502 plate appearances to be a qualified batter and with 24 games left Trout would have to average 3.75 plate appearances per game, which is doable. So while Trout has a good chance of reaching the bar he needs to get to, there would still be a few writers who might not vote for him because of time missed. Luckily, there are a few precedents that show it can and has been done before. First, go back to 1962 when Mickey Mantle missed 25 games in May and June of that year. Mantle would justbarely squeak in enough plate appearances (502) to qualify for the batting title and win MVP. Mantle also lead in many of the same categories that Trout leads in right now and would garnish a Gold Glove award. George Brett in 1980 missed 25 games with an ankle injury and racked up 515 plate appearances. George flirted with .400 for most of the year and would also lead the league in most of the same categories as Trout. 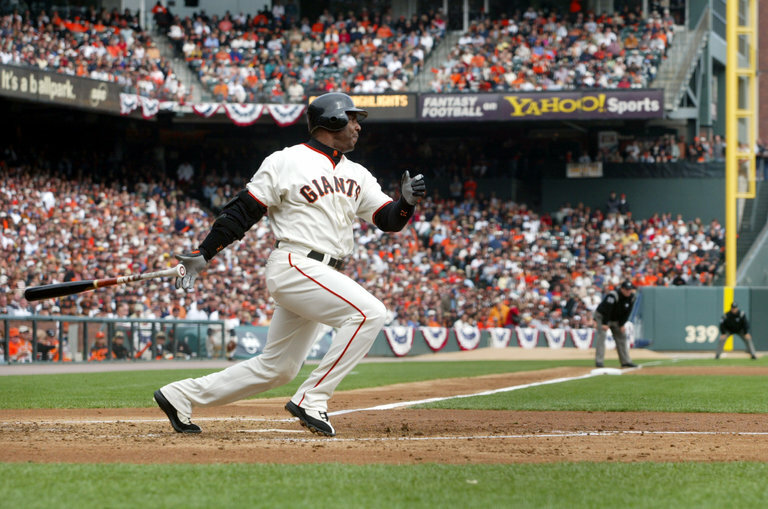 Finally, Barry Bonds missed 32 games in 2003, racked up 550 plate appearances, 10.2 WAR and would win his 6th MVP award. In all three of these cases, a player missed a significant amount of time to injury yet had such potent offensive seasons that the voters could not dismiss their contributions to their team. To me, that reads just like Trout this year and shows that if the numbers are there, it should be an easy vote come the end of the season. So while Mike Trout hasn’t passed Jose Altuve just yet, it’s hard to imagine a scenario where it doesn’t happen before the end of the season. You almost feel sorry for guys like Altuve, Judge, Manny Machado and others; they are playing at the same time as one of the greatest players of not only this time period, but easily one of the best of the last 30-40 years. Mike Trout appears to be on a completely different level and this year the numbers say he is doing it in a slightly shorter amount of time. While a vote for Altuve wouldn’t be a bad vote, it would be ignoring not only what Trout is achieving but also what he is doing to help lead an Angels team to contention. It might feel redundant to say Trout should be MVP each year, but it would also be foolish to vote against him just for the sake of change. Last year in August, I said Trout should be in the conversation for MVP and I was scoffed at. I was told Altuve had it in the bag. Trout ended up winning the award. This year I make a different proclamation: Mike Trout should be MVP again. This time, it might be wise to just admit the arguments against him aren’t as strong as the arguments for. All hail Mike Trout. The entire baseball community has been mourning the sudden death of Miami Marlins All-Star pitcher Jose Fernandez since the news of his passing on Sunday morning. I, like many others, was in a bit of a haze on Sunday, as it was hard to grasp that such a talent with his whole life in front of him was now gone. I’ve tossed around writing about Fernandez the last couple days, but in some ways felt I wouldn’t be able to do him justice nor say anything that hasn’t already been said by many others. Instead, I finally decided on doing something else to honor him; show you his greatness rather than talk about it. Actions speak louder than words, and with that in mind, here are some favorite Jose Fernandez moments to remember him by. First, there is his first major league home run. Yes, it’s weird I started off with a batting highlight for a great pitcher, but the joy he showed in this personified him to a ‘T’. Also, baseball’s unwritten rules are still stupid. There was zero reason for anyone to get mad at him for watching his first ever home run. Speaking of firsts, here is Fernandez’s major league debut. At the beginning, glance at his minor league numbers. Twenty Seven total minor league games?? Crazy. It was known very early on that this kid was going to be special and he was. Instincts. This is Fernandez at 21. I’m not so sure many veteran pitchers would have that kind of “game awareness”. A great play on defense. Seriously, this speaks for itself. Folks, baseball is a kid’s game and no one understood that more than Jose Fernandez. For the unaware, Fernandez was a very good pitcher. This highlight from back in July was not only a career-high in strikeouts, but also his 500th career strike out. When healthy, Fernandez was easily one of the best pitchers in the game and a treat to watch. Cuba vs. Cuba. Fernandez vs. Puig. That smile. Fernandez just loved playing baseball and you could tell. I feel like I am underselling it when I say he was a great pitcher. He was a great athlete. This, also from July, was Fernandez pinch-hitting in extra innings with a big pinch hit double. In some ways it made perfect sense that Fernandez was playing in the National League, where he could pitch and hit. Seriously, Fernandez made Barry Bonds smile. That within itself should show how special Jose was. For me, a longtime Bonds fan, this is great to see. Barry and Jose, enjoying the game and having fun. That reaction. I almost wish I was a Marlins fan. I celebrated after the Royals won the World Series last year…but not like that. Just fantastic. This was Fernandez’s final start, a week ago against the Nationals. Fernandez threw 8 scoreless innings, striking out 12. In other words, he was making a push to be named the National League Cy Young award winner. Vin Scully has a way with words. It only made sense to have him talk about Fernandez and relay a great story in the process. There is a big hole that is now missing in Major League Baseball. Fernandez was not just a once in a lifetime player that the game could use as a spokesman for as to why baseball is so great; Jose was a once in a lifetime person. Fernandez joins a list of players taken too soon from us, guys like Roberto Clemente, Thurman Munson and Darryl Kile. The only difference is that those players were all veterans who had made their footprint in baseball for years; Fernandez was just getting started. As much as Jose will be missed, there will come a time that a new player will come along with great talent and unbelievable joy. There will be a player who just oozes happiness to be part of this grand game. When that happens, I hope it makes us all think about Fernandez. We will all miss watching him perform on the diamond, but I think I will miss that contagious smile more. Rest in Power, Jose.